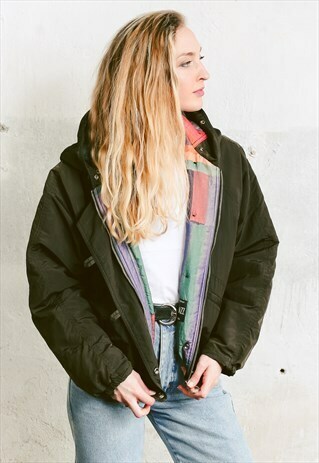 Take a look at this vintage early 80's khaki green padded jacket with a hood and cropped hem. Made of nylon, lined in contrasting bold fabric. Features raglan sleeves, a drawstring hem, 2 outside pockets and zip plus loop button fastening. An authentic vintage piece for your everyday adventures. Made in Italy. -- MODEL is 5'5 ft (1,67 m) tall, she wears size available. -- SIZE. Estimated fit: size M (marked size Italian 44). To be sure it would fit please check the measurements: Length: 22 " / 56 cm . Armpit to armpit: 24 " / 61 cm. Sleeve (measured from neckline): 28 " / 71 cm. MODEL is 5'5 ft (1,67 m) tall, she wears size available. SIZE. Estimated fit: size M (marked size Italian 44). To be sure it would fit please check the measurements.